Play Sonic Classic Heroes online with Sega Genesis browser emulation for free! 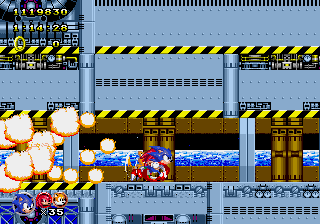 Sonic Classic Heroes is a rom hack of Sonic the Hedgehog 2 (GEN). Play it with our flash, java and rgr plugin emulators. Nothing to configure, we've done it for you! 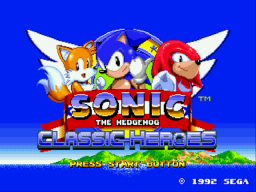 Sonic Classic Heroes is a ROM hack for the Sega Mega Drive / Genesis that is the result of a collaboration between flamewing and ColinC10, combining their respective hacks Sonic 2 Heroes and Sonic 1 and 2. 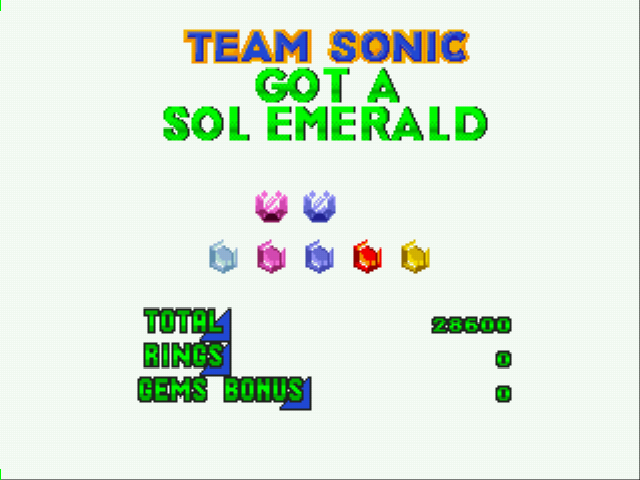 It therefore is a single ROM that offers the entire campaigns of Sonic the Hedgehog and Sonic the Hedgehog 2, either alone or together; and enables the player to direct any from one to all three of Sonic, Tails, and Knuckles. 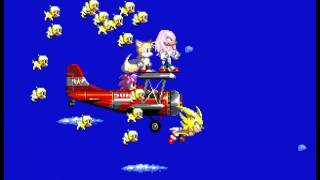 The hack is named after this latter ability to control a team of characters, which is reminiscent of the more recent 3D game Sonic Heroes. Oh no! How could he! Well, hello everyone again! Looks like I decided to actually make another review and this time, the game that I'm making a review about really deserves an awesome rating. Now, let us see why this game deserves an awesome rating! Well, Whats so "unique" about this hack of a Sonic game? Okay, so many times you probably have heard of Sonic hacks where you can play as a different character, like tails in Sonic the hedgehog, or Knuckles in Sonic the hedgehog. 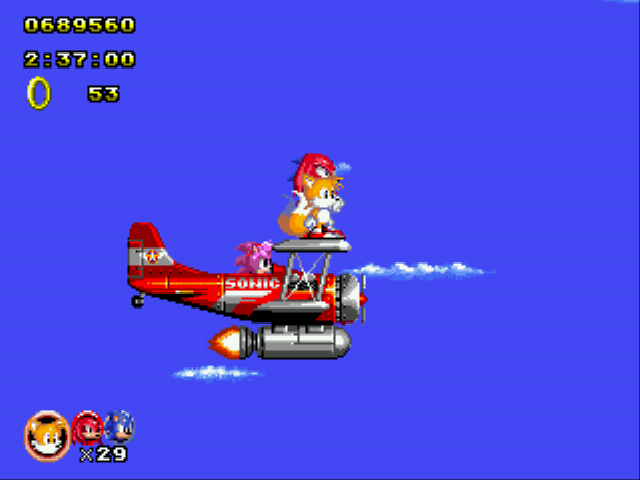 And also probably already know that you can play as tails in the original Sonic the hedgehog 2 game (but without the ability to fly :() and you can also play as knuckles in the original levels of Sonic the hedgehog 2 with all of his signature moves of gliding and climbing but with low jump but using the cool lock on feature of Sonic and Knuckles. But have you ever heard of playing as all 3 of them at the same time? 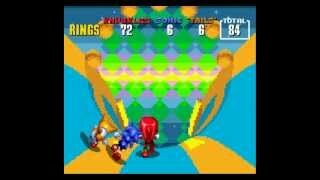 Have you also heard of a hacked Sonic game with the original Sonic the hedgehog 1 levels directly connected to the original Sonic the hedgehog 2 levels (I meant that after you finish all of the Sonic the hedgehog 1 levels, you directly continue to the original Sonic the hedgehog 2 levels). Also there is a huge menu with 12 save slots, options for team sonic, and a level selection screen were you can choose from the original Sonic the hedgehog 1 and 2 levels and it doesn't require cheats! In this awesome hack, you definitely can play all of this awesomeness! 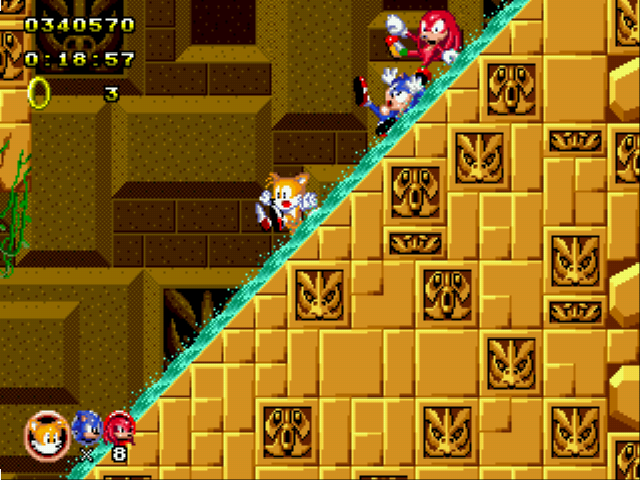 So basically, what I meant by playing as Sonic, tails, and knuckles, you actually switch around the characters. Like you play as Sonic while tails and knuckles is following you, and then you can switch to tails while Sonic and Knuckles are following you, and then you can switch to Knuckles while Sonic and tails are following you. Similar to Sonic heroes for ps2 except it's for sega genesis and you play in the original Sonic the hedgehog 1 and 2 levels! So now, let us talk more about this awesome game! 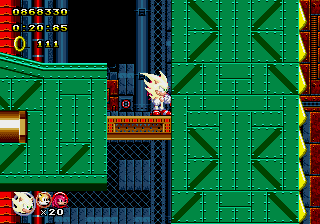 Well, the graphics is almost the same like the original Sonic the hedgehog 1 and the original Sonic the hedgehog 2. However, the Sonic the hedgehog 1 or 2 sprite is replaced with the Sonic the hedgehog 3 sprite. 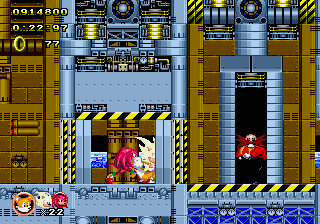 Also the knuckles sprite is from the original Sonic and Knuckles game, the tails sprite is from the original Sonic the hedgehog 3 game, and the Amy sprite from the original Sonic CD game. I can't tell you when Amy comes or else that will be a spoiler, find out yourself! 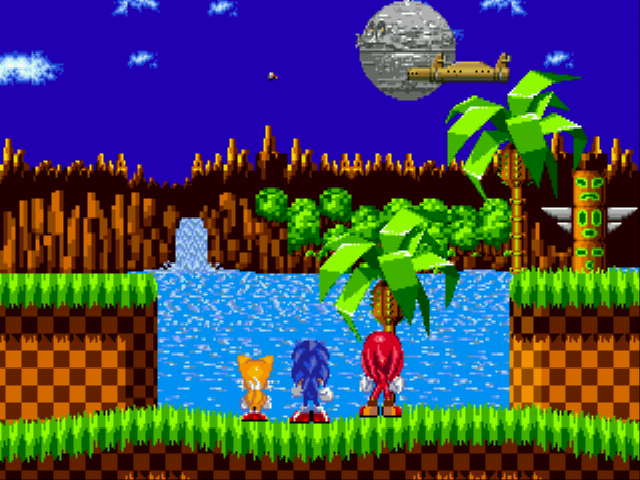 Also the title screen is similar to the original Sonic the hedgehog 2 title screen but with knuckles also standing next to Sonic to your right and tails standing next to Sonic to your left while Sonic is obviously in the center and yes that is very cool! Also the menu has a cool back drop style as the background! Okay, for the Sound, you probably already know what I'm about to say. The sounds are all from the original Sonic the hedgehog 1 and 2 games. 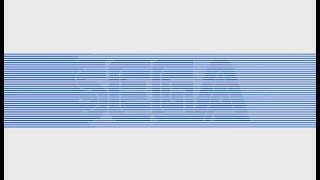 Their is also the Sonic the hedgehog 3 final boss background music too but I can't tell you when that comes or else thats a spoiler. That is something for you to find out! Well, this game is definitely addictive, well, at least for a Sonic fan like me! Especially since there is a level selection screen where you are allowed to play your favorite levels as much as you want with the awesome 3 Sonic characters, Sonic, tails, and knuckles! 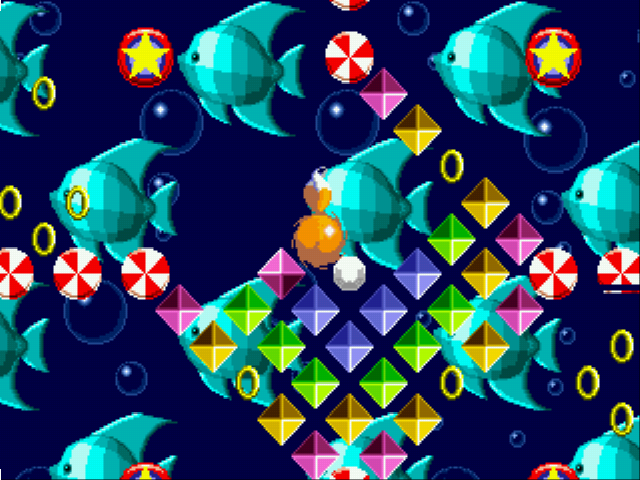 You would probably feel like, "I must complete this huge Sonic game!". 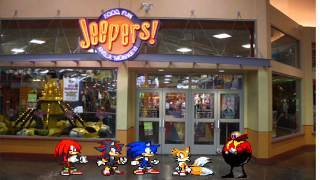 And now, here is one of the best pros of this Sonic hacked game. Usually the Story in most Sonic games are too simple and horrible. Well, this story in this hack of Sonic is also sort of simple, however it still deserves a very high rating because I never seen anyone with the ability to enhance the story of a sonic game as great as this! So basically at first the story just goes normal just like the original Sonic the hedgehog 1, but after you complete the final zone in the original Sonic the hedgehog 1 (I meant the final level in the original Sonic the hedgehog 1), that is where the story really starts to get amazing! But I'm not going to tell you anything else about this or else once again, this would be a spoiler! Find out yourself! 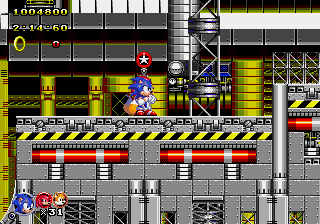 Well, the game starts out easy and slowly starts getting really hard, but also after you finish the Sonic the hedgehog 1 levels, it starts with the easy Sonic the hedgehog 2 levels but then it slowly gets harder again! i told u! 1st place! Sonic Classic Hero's Fastest time thread! Playing local with my friend is awesome. Nice Game. Thanks be to Ennitan for showing me this game. 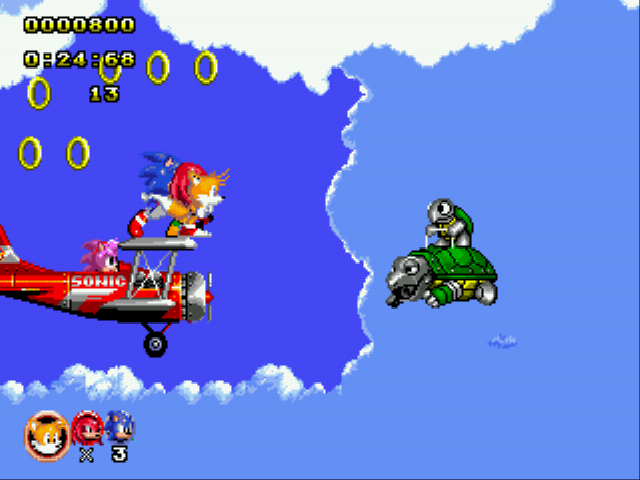 I love this game, especially how the Special Stages from Sonic 1 and Sonic 2 are in it! Welp this game is still always awesome i think all of us if it was deleted we would cry. ...THIS GAME IS SO AWESOME ANY one who doesn't like it sould DIE! 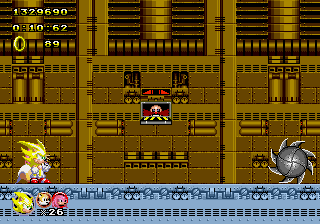 anyways how do people turn super on the death egg zone!? you need 50 rings don't you !!!! 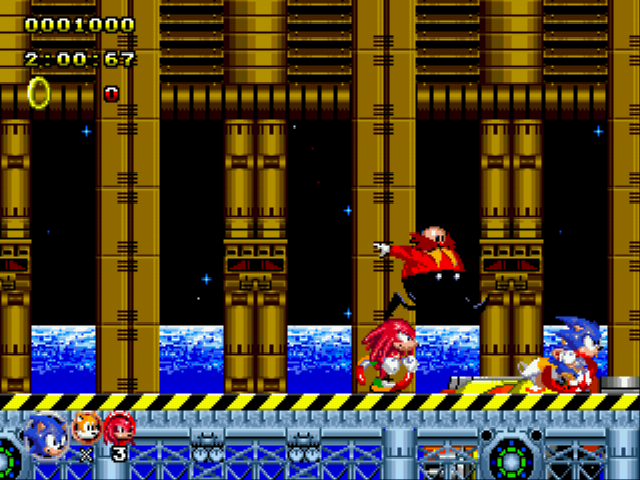 this game is awesome, it has been a while since I have played it but it has always been one of my favorite classic sonic games to play, it is 3 times the fun now with knuckles! This game is great!